The Audi TT, possibly one of the sexiest production cars to come out of a mainstream manufacturer in a long time, is also one of those cars that needs to be looked after, not just kept in a garage, but actively cleaned, tuned, and maintained. Originally designed in California, the car is produced in Audi’s factory in Hungary to exacting standards with performance in mind. This is not a vehicle for the weak willed, this is a thoroughbred automobile that looks like it belongs on a race track. Priced high enough to turn heads, but low enough to be a realistic proposition for the demanding motorist, the Audi TT makes anyone look good sitting behind the wheel and if tuning your Audi TT to perfection is your thing, the TT is over engineered and quite capable of handling a performance tweak or two. Of course Audi TT tuning is dependent on the model and year you have, but it’s safe to say that even a 1998 model can be tuned to give an extra 50-60bhp from remaps, and whilst this seems like an expensive modification, the increased performance makes for a more exhilarating drive. Affordable performance modifications involve simply replacing the factory standard spark plugs with high performance plugs, changing the oil to race spec oils, and making sure the engine and drive train are in top condition. More extensive tuning will usually mean taking your TT to an Audi authorized service center, or custom tuning shop. Any reputable mechanic will first put you car on a rolling road or chassis dyno and test the base power specs which gives a good idea of how well tuned your car is. From this point, working on increasing performance is just a matter of cost, how much do you want to spend to get the best result from your Audi TT. Engine tuning will most likely begin with remaps but if budget is no concern, could easily extend to component replacement. Remaps are a popular first step simply because the only thing that needs to be removed is the chip, which is reprogrammed way above Audi’s factory presets, and then soldered back into place. The engine and turbo need to be in good condition before attempting a remap. More extensive tuning will likely see you replace your outlets, or even the complete exhaust system, especially given the slightly below par performance of the factory standard exhaust which is squashed under the Haldex unit preventing full flow. Sure, the average driver won’t notice, but we do. Extra boost on full throttle even after a remap can be achieved by replacing the standard diverter valve, for a valve with faster response, you’ll feel the difference in the kick when the turbo kicks in, it is that noticeable. Similarly, tuning your Audi TT with a new air intake that delivers more cold air faster directly where it’s needed, it’s basically the same as adding a supercharger but without the headache of increased insurance or registration costs. Tuning an Audi TT for maximum street or race performance is just a numbers game, how much can you afford to spend, but realistically, getting better boost, a harder ride, and more responsive handling is a fraction of the cost of the new car making it a great investment. 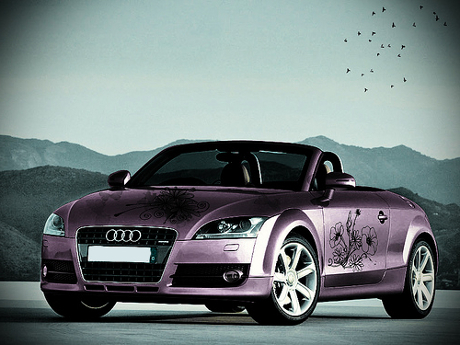 Learn more about Audi TT Tuning.